The clear “no” votes in the Netherlands and France on the EU Constitution led some market participants to remark that the euro has become a currency without a country. Italian labor minister Roberto Maroni even suggested that Italy should consider dropping the euro as its currency. Maroni is a member of the Northern League regionalist party, which fights for a separate state for northern Italy. He said the lira, Italy’s former currency, should be temporarily reintroduced because the euro has led to economic problems, including a loss of competitiveness and high unemployment. Italy’s finance minister, Domenico Siniscalco, rebutted this argument, saying that returning to the lira made no sense because it would raise the cost of financing Italy’s debt. The euro weakened sharply in response to the twin “no” votes, but analysts say the initial reaction appears to have been overdone. The European monetary union, or EMU, is not about to fall apart and the euro will still achieve full reserve-currency status, although it may take somewhat longer than had been expected, currency market analysts say. “The votes against the constitution have raised the perceived political risk in Europe and put the spotlight on some of the relative-growth issues and the difficult economic backdrop,” says Robert Lynch, head of Group of 10 foreign exchange strategy, the Americas, at HSBC Bank in New York. “The euro itself has been a success, not only as a big, active market, but also as a medium of exchange,” Lynch says. “The euro is backed up by a liquid money market and is useful to investors,” he says. While the immediate market impact of the Dutch and French “no” votes was a great deal more significant than had been expected, the outcome of the voting will not change the viability of EMU as a project, according to Lynch. “Over time, the euro will still take on a greater role as a reserve currency,” he says. 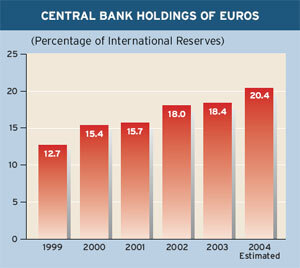 World central banks have increased their holdings of euros from 12.7% of international reserves at the end of 1999 to 18.4% at the end of 2003, according to the International Monetary Fund, and HSBC estimates that the percentage of reserves in euros rose to 20.4% in 2004. Despite the euro’s recent slip, it likely will continue to perform well against the dollar over the longer term, Lynch says. “At the end of the day, the US still runs considerable twin [current account and budget] deficits, and there still will be issues associated with funding the deficits,” he adds. The dollar’s gains so far this year, reflecting capital flows into the US, do not mean that foreign appetite for US assets will remain strong forever, Lynch says. Growth in the US economy likely will slow later this year, at about the same time that market participants become convinced that the Federal Reserve is almost done raising interest rates, and this could set the stage for a renewed decline in the dollar, according to Lynch. Other analysts also say they have not abandoned their longer-term bearish views on the dollar. 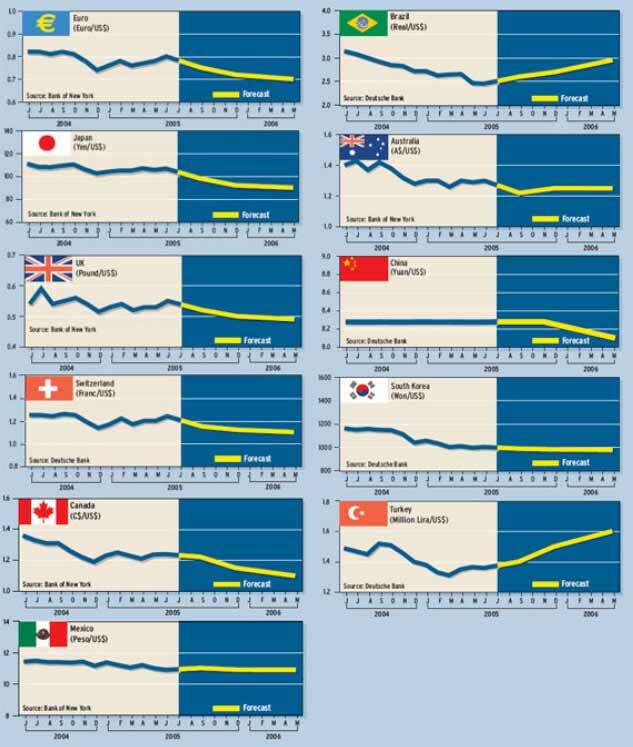 “The more the dollar strengthens, the more US external imbalances are compounded, and the greater the likelihood of a disorderly adjustment later,” says David Gilmore, economist and partner at Essex, Connecticut-based Foreign Exchange Analytics. However, in order for there to be a major sustainable downward trend in the euro and rise in the dollar, Gilmore says, there will need to be a reduction in the US budget deficit. “On the surface, US economic fundamentals appear strong, and they appear very strong next to Europe and Japan,” Gilmore says. “But probe under the armor, and the knight is soft and vulnerable,” he says. Stephen F. Auth, executive vice president and chief investment officer at Pittsburgh, Pennsylvania-based Federated Investors, one of the largest investment managers in the US, says the principal impact of the referenda in France and the Netherlands is political, not economic. The proposed constitution would provide a political framework for Europe, he says. In contrast, the current monetary union, which broke down most trade barriers between member nations and provided a common currency, remains intact, he says. Under the monetary agreement, companies in countries with high tax rates, such as France and Germany, must compete with the likes of Ireland, where the tax rate is only 10%, Auth says. In response, the companies of “Old Europe” are improving their own internal productivity, often by moving facilities to markets with lower labor costs within the EU, he adds. During the latest cycle of dollar weakness, Japan and China have not been purchasing their own currencies with the dollars they hold, he says. 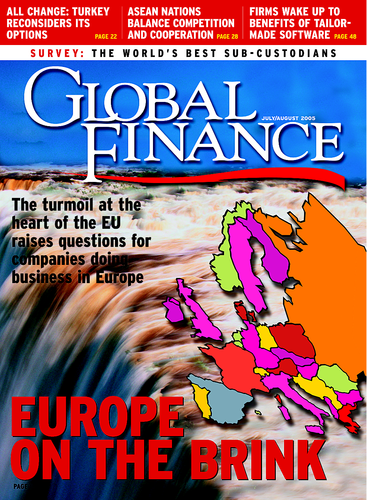 Instead, they have purchased euros, driving up the value of the euro, according to Auth. The situation could change some time in the next 12 months, he says, but not until the US stops pressuring China to revalue. “While revaluation probably would benefit China in its fight against inflation, that nation’s leaders do not want to be seen as caving in to US demands,” Auth says. The EMU will be around for a very long time, he says, because it would be extremely costly for a country to drop out. If Italy were to drop the euro, it would cost it several hundred basis points more to borrow, he says. “The EMU is like the Hotel California,” Weinberg says. “People go in but they don’t come out. To leave now would require the economic equivalent of war,” he says. Flat to lower labor costs will persist in developed Europe, Weinberg says. “Fiscal policy in Germany cannot make wages grow strongly again. There can be a rise in government spending, but not in workers’ incomes,” he says. The rejection of the EU constitution by voters in France and the Netherlands represents a setback for further EU integration and expansion and coordinated structural reform, says Jean-Francois Mercier, European economist at Citigroup in London. But the abandonment of the constitution would not mean the unraveling of the EU or EMU, which would continue to operate under current treaties, he says. “A key implication of weaker EU institutions and stalled integration could be a persistent and widening performance gap across the EU,” Mercier says. The EU countries that implemented the most far-reaching reforms, notably the UK, Sweden, Finland and Ireland, have enjoyed stronger economic performance in the past decade, he says. “As a result, these countries probably will continue on the policy path that has yielded relatively successful results,” Mercier says. “In fact, lesser policy coordination at the EU level may paradoxically give them more leeway to reform, particularly if attempts to harmonize tax or labor law stall,” he says. The timetable for EMU membership of the 10 new member countries that already have joined the EU is unlikely to be affected, since it will depend on economic and fiscal performance in these countries rather than EU institutional issues, according to Mercier. “Similarly, the outlook for 2007 EU entry of Bulgaria and Romania remains relatively safe,” he says. “The case for countries yet to negotiate their entry, including Turkey, Croatia and Serbia, is more tricky, and existing EU members will adopt a tougher negotiating stance in the wake of popular concerns about enlargement,” Mercier says. But EU entry for these countries will not happen for some time, leaving them ample time to meet the entry criteria, he says. Meanwhile, the US economy appears to be growing at a healthy pace, and US short-term rates are rising, giving the dollar an opportunity to take advantage of the euro’s current misfortunes, analysts say. However, the US employment report for May surprised financial markets, with job growth of 78,000, the lowest in nearly two years, coming in even below the most bearish forecasts. The dollar declined initially on the weaker-than-expected report, but analysts say the temporary setback was not enough to force the dollar bulls to capitulate their positions. “Indeed, the report is far more positive than the headline number suggests,” says Michael Woolfolk, senior currency strategist at Bank of New York. For one thing, the unemployment rate fell to 5.1% in May, the lowest since September 2001. And the household survey of employment conditions showed continued strength, remaining out of synch with the payroll data. “Continued pessimism in business confidence appears to be weighing on job growth in the service sector, contrasting with the rebound in consumer confidence and strong spending activity,” Woolfolk says. With unemployment continuing to fall as incomes rise, the US economy remains well supported by consumer spending, he says. In this light, weakness in the manufacturing sector and shaky business confidence will not get in the way of the Federal Reserve, which will keep raising interest rates at least a quarter point at each of its scheduled meetings this year, until the federal funds target rate reaches at least 4%, Woolfolk says. In Congressional testimony in June, Fed chairman Alan Greenspan said it was difficult to know where the neutral federal funds rate is, but that the Federal Open Market Committee will probably know it when it sees it. Greenspan’s comments suggested that it is still too early for the Fed to begin thinking about a pause in its policy of gradually raising rates, Woolfolk says. Meanwhile, the tone of comments from officials at the European Central Bank has changed since earlier this year, analysts say. ECB officials seem less likely to raise rates in the face of continued weaker-than-expected economic growth across Europe, they say.